Background and Purpose: The Sudan Health Consultancy (SHC) is a voluntary group which first came together in 2003. 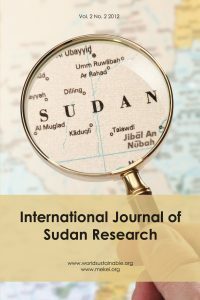 This paper follows from the group contribution to the First Diaspora Conference, and reflects on our recent journey to sustain our contributions to capacity building, research and development in the Sudan. Approach: We have formalised our relationships from an informal voluntary group into a registered limited company with a network of networks. Findings: Formal links have been established with the national Public Health Institute (PHI), Federal Ministry of Health (FMoH), Sudanese Medical Specialisation Board, the Community Medicine Association and universities. We have signed Memoranda of Understanding with the UK Academy of Royal Colleges and the Faculty of Public Health and we are currently delivering on the agreed work plans. Conclusions: We highlight challenges and opportunities to formalise the Diaspora contribution. This paper concludes with our next steps, and suggests cross-sectoral initiatives to improve public health in Sudan.